Eva Shortt is a graphic designer from Limerick. Having completing her Degree from Limerick School of Art and Design in 2011 she has gained a wealth of experience working within the industry. In 2014 she undertook as Master through Research at LSAD. The project explored the visual identity of cities and resulted in the creation of, what can be described as, a proposal for a city considering the development of a visual identity. The limited edition document was selected for the 2017 100 Archive Selection, an esteemed living archive which maps the past, present and future of Irish graphic design. 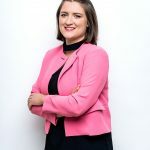 Eva now collaborates with clients as Creative Lead at The Pudding – a creative and commercial brand agency with offices in Dublin and Limerick. She has been responsible for the creation and execution of many brand identities across a broad range of industries including hospitality, technology, Government bodies, cultural and youth organisations and start up’s. Her work for the Osprey Hotel was shortlisted for a 2017 IDI award.